Lithium-ion batteries are powering cars and backing up buildings, so why shouldn’t they replace dirty, noisy mobile generators as well? It’s a bit hard to believe, but this no-brainer concept hasn’t led to a commercial-scale product yet -- until now, that is. Last week, Boulder Power Technologies started offering its PowerTap 2000 for limited commercial availability in its home state of Colorado. 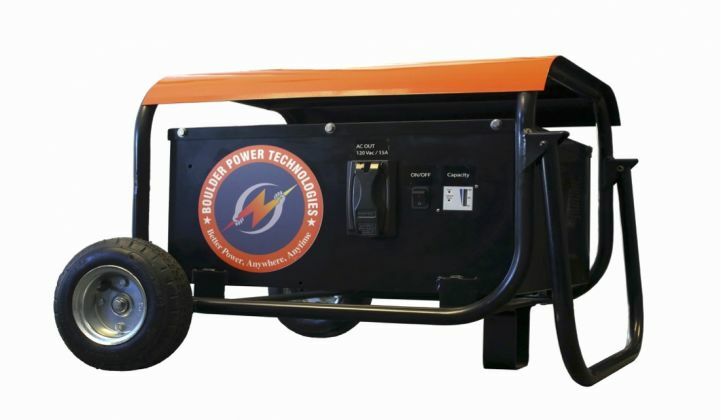 The lithium-ion battery based unit retails for $3,499, quite a bit more than equivalent gasoline or diesel-fueled generators. But it’s also silent, emissions-free, provides steady alternating current, and perhaps most importantly, replaces the dollars-per-gallon refueling costs of traditional generators with pennies-per-kilowatt recharges from a standard wall socket. An hour to 90 minutes of charging is enough to power from 7 to 12 hours of operation for most plug-in power tools, lighting and sound systems, water pumps and other typical generator loads, according to last week's press release. Boulder Power is banking on the idea that these advantages will make up for the extra upfront costs, and give early customers the impetus to buy and test the device’s durability, in advance of a broader commercial rollout planned for June 2015. It’s far more efficient to store and discharge electricity than it is to spin a motor to generate it, and less prone to breakdown and maintenance problems, he noted. Beyond that, batteries can provide clean AC power that motor-driven generators may require an additional inverter unit to provide, which is important when you're plugging in more sensitive power electronics equipment, he said. But the bottom line for most users will be cost and reliability, according to Ruble. 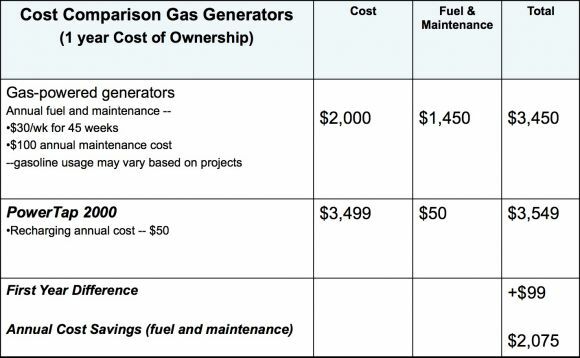 On the cost front, Boulder Power has broken out its expected long-term operations cost compared to a $2,000, 2000-watt generator, which typically burns a half-gallon to a gallon of fuel per hour of operation. According to this analysis, getting rid of fuel costs and maintenance costs allows the PowerTap 2000 to pay back its extra costs in a little more than a year. There are cheaper 2000-watt generators on the market, of course. Even so, the PowerTap 2000's average annual operating savings should help it come out ahead of even the cheapest equivalent units in terms of ownership costs within two years, he said. As for reliability, the first question is how long the PowerTap 2000’s battery can last in the field. “We tell people, 7 to 12 hours, depending on usage,” Ruble said. “That’s going to vary. If you’re using a table saw or two table saws, it’s going to deplete a lot faster than if you’re just using it for your PA system or your refrigerator.” Even so, needing to recharge for an hour or more is less convenient than refilling a fuel tank, which could limit its attractiveness for construction companies and contractors who need to keep generators running for long work days. The other important reliability issue is how well Boulder Power has put together its batteries and power electronics to last under real-world use. The startup is offering a one-year warranty for its U.S.-built units. It also has some connections on the battery engineering and integration front. Darren Johnston, the company’s chief operations officer, is also CEO of CIE Solutions, a Boulder-based customized battery integration engineering firm that is one of the joint venture partners behind Boulder Power. Ruble pointed out that many of the biggest companies in the generator space, such as Honda, Briggs & Stratton, Cummins and Yamaha, are motor manufacturers first and foremost, and see the generator market more as a destination for that primary product than as an end in itself. Meanwhile, the lithium-ion battery giants got started in the consumer electronics and power tools markets, have moved on to the next big emerging market of electric vehicles, and are looking ahead to grid-scale energy storage. Boulder Power is internally funded by its partners, and hasn’t disclosed how much money it has put into designing and building its first products. Ruble said the company expects revenues from its first product sales to fund internal development, though it may seek outside funding if sales take off. In the meantime, lithium-ion batteries are being put to use for purposes that could start to intrude on the sweet spot that Boulder Power is targeting, either from below or above. On the slightly smaller side, a slew of external battery recharging devices exist for consumer electronics, laptops, televisions and other smaller household appliances. On the larger scale, of course, are the battery backup power systems being installed in homes and businesses around the world. That means that today’s apparent lack of commercially available, battery-based mobile generators isn’t likely to last for long, Ruble said. “We need to keep ahead of that competitive curve -- we know there are companies out there that are going to be pretty well positioned,” he said.